Land Rover has revealed further details of the new five-door version of the Range Rover Evoque, following its announcement at the Paris Motor Show. The newcomer will be just as stunning as the coupe Evoque, but with extra practicality and more family appeal, while prices will start at a very competitive £30,000 when it goes on sale in Summer 2011. With the same compact dimensions and advanced technologies as the coupe model, the five-door Range Rover Evoque is positioned as the smallest, lightest, most fuel-efficient Range Rover ever. It features lightweight construction techniques and offers the choice of a front-wheel drive variant. A new range of state-of-the-art petrol and diesel engines come with direct injection and stop-start. The Range Rover Evoque also adopts low CO2 systems such as Electric Power-Assisted Steering (EPAS) and is built to maximise end of life recyclability. Despite having a more capacious interior, the five-door Range Rover Evoque has an identical overall length and width as the coupe. However, it's 30mm taller and adds further space for rear passengers who get 50mm more shoulder room, along with generous headroom which compares very favourably to traditional 'sporting saloons'. A full-sized glass panoramic roof increases the feeling of space by flooding the interior with natural light, and offers even greater headroom for all occupants. Customers can specify soft, premium leather and tailored, twin-needle stitching providing a luxurious finish to almost every surface of the instrument panel, doors and seats. The rear seats, with seat belts and head restraints for three passengers, have 60/40 folding seat squabs and are equipped with Isofix child seat mounts. When required, luggage capacity can be expanded to an impressive 1445 litres. On the open road, the five-door Range Rover Evoque has been designed to offer 'a polished driving experience that combines dynamic and sporty handling with responsive, effortless performance and refinement'. The optional Adaptive Dynamics system with advanced MagneRide dampers provides a balance between a supple, controlled ride and sharper handling responses. Drivers who take their Range Rover Evoque off-road will be reassured to know that, in addition to extremely generous ground clearance, the car has better breakover and departure angles than other compact SUVs. The Evoque will be the first Range Rover to offer customers a choice between a full-time four-wheel-drive system, which delivers outstanding performance and traction on all surfaces, and a low carbon, front-wheel-drive option for further enhanced fuel economy. The five-door Range Rover Evoque shares its turbocharged powertrain line-up with the coupe model. The state-of-the-art diesel and petrol engines offer smooth and responsive performance, blending four-cylinder efficiency with six-cylinder refinement and power. Customers can choose between two comprehensively updated 2.2-litre turbodiesel derivatives, with 190bhp or 150bhp. In the five-door model, the front-wheel drive Range Rover Evoque with the 150bhp 2.2-litre engine achieves sub 135g/km CO2. A new 240bhp, 2.0-litre Si4 petrol engine combines direct fuel injection, turbocharging and twin variable valve timing for exceptional driveability and fuel efficiency. 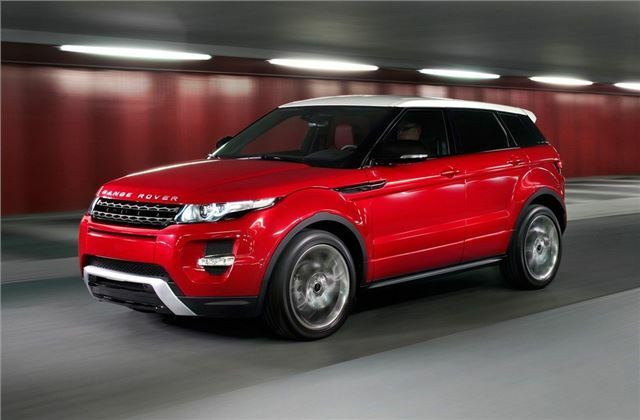 Like the coupe model, the five-door Evoque gets the same high-end innovative technologies as the larger Range Rovers. An intuitive control system and touch-screen display combines a stylish, uncluttered layout, state-of-the-art functionality with class-leading ease of use. The display is available with dual-view technology, so that driver and passenger can view independent content. Connectivity options include Bluetooth hands-free mobile phone and audio streaming, plus a range of USB and auxiliary inputs for iPods and other portable devices. The five-door Range Rover Evoque follows the coupe model by offering customers the choice of three main vehicle design themes, each with its own distinctive character, exterior treatment and carefully co-ordinated interior package. ‘Dynamic' brings a bolder exterior with 20-inch wheels and unique bumpers, grille and tailpipes for a more assertive stance. Contrasting roof and spoiler colours are available, while the premium sports interior offers sports seats with splashes of bright contrast colour. Both coupe and five-door models of the Range Rover Evoque will be manufactured at Land Rover's multi award-winning Halewood plant in Merseyside, UK.